BLANDFORD, Nova Scotia (CNN) -- A SwissAir jet disappeared from radar screens Wednesday over the Atlantic Ocean near Nova Scotia, and there were unconfirmed reports that it may have crashed. Lt. Cmdr. Mike Considine of the Canadian Navy said the MD-11 disappeared from radar about 10:18 p.m. (9:18 p.m. EDT/0118 GMT). A search-and-rescue operation has begun. Considine said he could not yet confirm the plane's origin or destination. 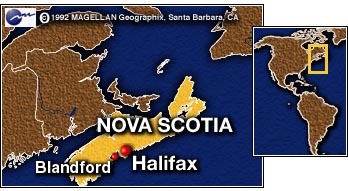 The Canadian Press, quoting witnesses, said the plane, with 150 people on board, reportedly had crashed near the tiny coastal hamlet of Blandford, about an hour's drive from Halifax. It was unclear whether the plane may have gone down over land or water.